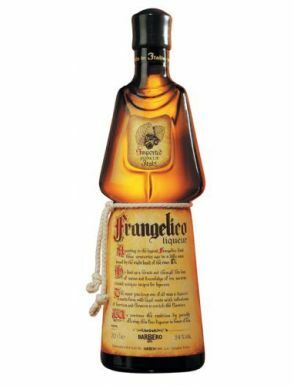 Frangelico liqueur is one of the most well appreciated Italian liqueurs. The name is based on a legend of a hermit monk named Fra Angelico who "created unique recipes for liqueurs." The bottle itself most closely resembles the habit of a Franciscan friar. Made from the aromatic Tonda Gentile hazelnuts found in the Italian region of Piedmont, they are combined with coffee, cocoa and vanilla distillate and extracts for a sweet yet balanced golden elixir that can be enjoyed in any season and on any evening. The palate has a rich texture, a pronounced but delicate hazelnut flavour with hints of Vanilla and dark chocolate and a smooth long finish with a fragrant back-note.